Your Next Stamp Challenge #7! Hello! Sorry I have been MIA! Time just got away from me these past few days. I've been trying to organize my office/stamp room a little bit~although I still have a LONG way to go :) Well, it's time for another YNS Challenge and our host is the fabulous Starlet Maylee who asked us to use embossing on our projects. You can use dry embossing or heat embossing or both! I almost always use dry embossing on my cards. I just love the texture it adds! I decided to step outside my comfort zone and heat emboss the sentiment as well :) I used this ADORABLE image from the Shopper Fhiona set~LOVE HER!!! The sentiment comes from Verve's Hearts on Fire set and the dp is Papertrey Ink. I hope you'll play along with us! The winner by random.org will receive $10 towards any YNS stamps and the special winner blinkie. Check out all of the other Starlet's fabulous creations by visiting the YNS challenge blog HERE. Thank you so much for stopping by and have a wonderful day!!! Your card is really pretty! I'd wondered where you've been :>) Isn't organizing fun?! AWWWW Kerri what a DARLING VALENTINE!!!! This is SWEET what a cute cute image!! LOVE IT! This is beautiful. I love all the detail and texture. It's a gorgeous colour too. This "pink" Valentine's card is just too cute! Beautiful! Love the pretty paper, adorable image & the great layout. I love this cheery, pink, happy card! And everytime I see one of your cards with the panel embossed this way, I remind myself that I have to try it! TOtally adorable. She looks like she hasn't a care in the world, beautiful coloring and fun vibrant colors. just too cute and amazing!! OMG Kerri this is totally adorable! I love Shopper Fhiona and she makes a wonderful Valentine's card! I love everything about it! Oh how sweet!! Love this image and your colors and design Kerri!! Gorgeous!! coloring!!!! LOOOOVE this Kerri! FAB layout and papers and I ADORE this image!!! She is so very sweet. 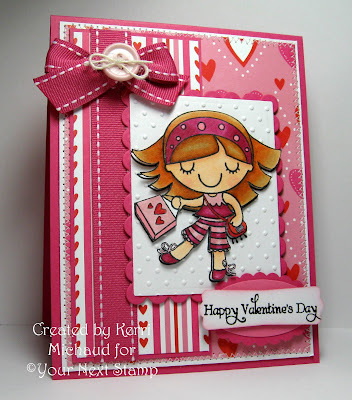 You did a perfect bow using the ribbon Kerri :o) Lovely pink and the embossing background is cute! Ohhh a little shopping girl - how cute! Did it come with the hearts on her bag or did you put those on to make it more Valentiney? She's soooo cute. This card is so busy - just what I like! Soooo sweet Kerri! I have such a hard time with pinks, but you really made this one shine...she's adorable! Great choice in papers, coloring job and I love that ribbon with the button...too cute! A beautiful card, love the colours and the way you have coloured Fhiona is stunning! !